A leading UK gasket manufacturer will, in November, unveil new high tech production facilities designed to slash lead times on the energy industry’s most innovative sealing products. J. A. Harrison’s £2.8 million scientific installation houses advanced technology, machinery and manufacturing processes that will significantly reduce downtime caused by leakages on oil and gas rigs, in pipelines, refineries, power stations and offshore wind farms. The supplier of bespoke and standard-dimension gaskets and seals to Siemens, General Electric and RWE N-Power among other major energy producers has earned a reputation in the energy industry for its responsive approach to customer crises, including full systems shutdowns. The new state-of-the-art facility in Middleton, Oldham – backed by the Dept. for International Trade through The Growth Company and to be opened on 10 November – was conceived to create the energy sector’s next generation of advanced design gaskets and seals. 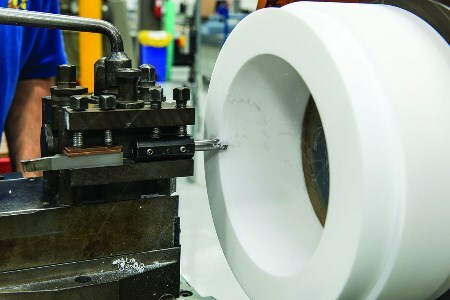 It incorporates computerised industrial presses, lathes, ovens and cyber safe systems capable of maximising the 38 000 ft2 installation’s output of specialised sealing product designs at industry-leading speeds. Its efficiencies will also enable J. A. Harrison to compete on price with gasket manufacturers in China and India. The benchmark facility will be revealed at an opening event expected to be attended by UK Northern Powerhouse Minister Jake Berry as well as representatives from the Bank of England. The event will also acknowledge the launch of an apprenticeship scheme, a new website and the rebranding of J. A. Harrison to appeal more directly to overseas users of it products.